There were hundreds of them before the war, but the fable-like houses with wooden verandas and openwork balustrades are slowly disappearing from the map of Otwock. Here are the most beautiful "Świdermajer" villas of the summer destination on the outskirts of Warsaw. They derive, for the most part, from a trend for relaxation. Local architects transported styles from across the world to the town Otwock near the Świder river. They looked up to the beautiful, decorated residencies in the Swiss Alps, as well as the cottages of Tsarist Russia. 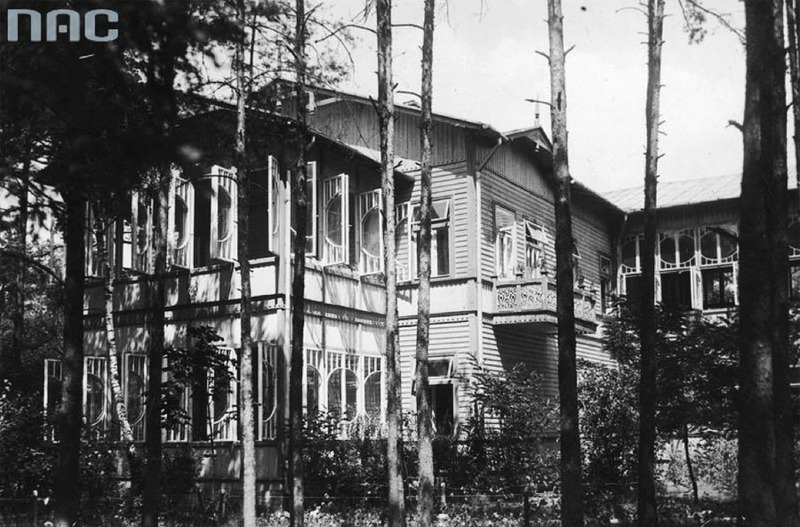 And thus, towards the end of the 19th century, the pine woods by the Świder river began to see ornate houses being built, whose distinct style was once monikered by poet Konstanty Ildefons Gałczyński "Świdermajer”, alluding to the 19th-century Biedermeier period. The prominent illustrator Michał Andriolli – known for his drawings in Mickiewicz’s Sir Thaddeus, among other titles – is considered the author of the style. In 1880, for the sum of 18 thousand rubles, Andriolli bought more than 200 hectares of land stretching along both sides of the Świder river. He was the first to start building wooden summer houses in this area, and some of them were also based on his original designs. 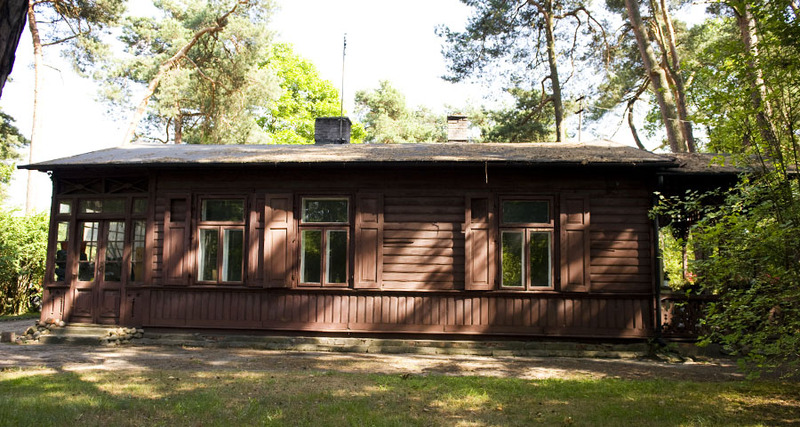 Prus, Tuwim and Korczak all marvelled at the Świdermajers, and Reymont is known to have spent his holidays there. Anin, Międzylesie, Radość, Miedzeszyn, Falenica, Michalin, Józefów, Świder, Otwock, Śródborów – these are the towns on the suburban Warsaw route that have an array of homes with the unique spirit. 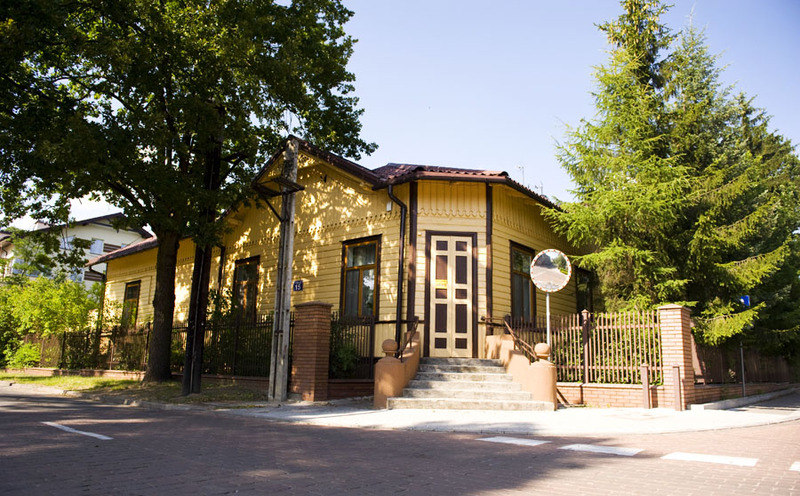 The stylish wooden villas that used to house pensions, hotels and sanatoriums back in the old days all constitute unique souvenirs of the area’s history. Who used to live in the houses? What is left of them now? Here is our photographic reportage from an excursion to the Świder river. We start our walk by the newly renovated Abram Gurewicz Sanatorium, the largest wooden building in all of Poland, and maybe in all of Europe. It is the most precious representative of local architecture, with its seven wings attached to each other, open terraces for sun bathing, and the charming verandas with glass windows. 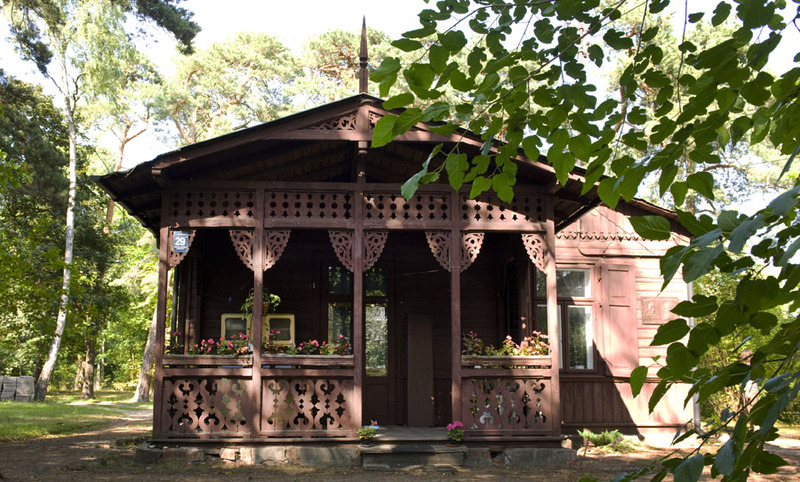 It is a treasure of Otwock which tells the centennial story of the trendy summer destination. Wealthy patients would come here before the war, in search of rest, a healthy climate, and entertainment. Bolesław Prus was thrilled by it, and Julian Tuwim and Janusz Korczak were both regular visitors. The villa was surrounded with a pine-scented park, and a cherished garden with an orangery, exotic plants, and fountains. There was a reading room, a play room, a dining room and a concert hall with a piano. For the past few years, Gurewicz has been coming to life for a few days in the spring. It opens its doors to guests of the Świdermajer festival, becoming a music stage, as well as a photographic and film site. Vocalist Mela Koteluk was so taken by the beauty of świdermajer that she made her videoclip in its garden for the song entitled "Melodia ulotna” ("An Ethereal Melody”), and in interviews, she admits that she regularly returns to Otwock and the surrounding area. The festival aims at restoring the pre-war trend for this summer destination. But let us return to history. The exclusive pension was constructed in phases, between 1906 and 1921, gradually transforming itself from an intimate Gurewicz Villa to a grand summer wellness resort. Later it would change its function many more times. 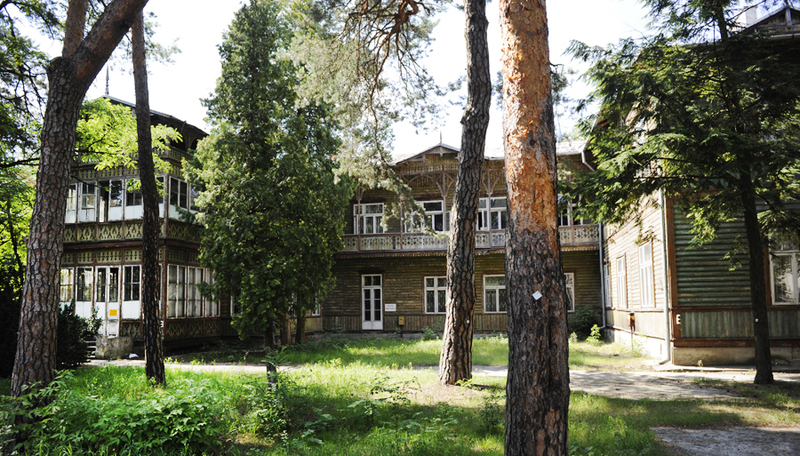 During World War II, it was the headquarters of a military unit and a military hospital, later serving as NKVD headquarters and a medical high school after the war. For years it would deteriorate into ruin, and now, thanks to its new owners, Gurewicz is set to be restored to its past splendour. In an interview for Gazeta Wyborcza, they declare "Its big tile stoves have been preserved in very good condition. They are devoid of any decoration, because Abram Gurewicz was not a spendthrift, but a practical person. We will certainly keep those stoves, as well as the old balustrade of the staircase. That is the reason we bought this building, in order to preserve something of the old atmosphere in it.” We will be watching you! We get to Kahan’s Villa through a sandy road hidden among the trees, over the other side of the train tracks. It is here, in the picturesque veranda with its well preserved openwork balustrade on 7a Konopnickiej street that the actress Danuta Szaflarska spent her time in the film by Dorota Kędzierzawska entitled Pora umierać (Time To Die). And just like in the film, each corner of this house has its own story. It’s worth taking a peek! 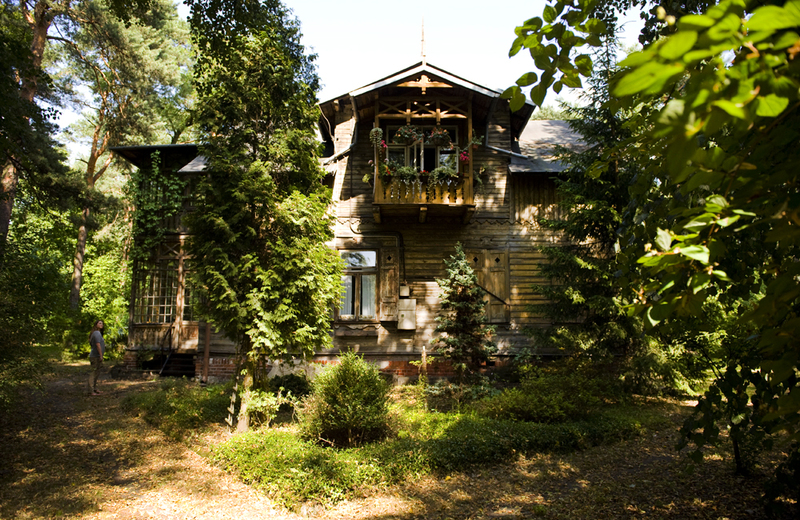 One of the most beautiful and nostalgic Świdermajers of Otwock is under the protection of a heritage conservationist. The door of the one-storey building from the late 19th century is opened for us by Maria Mikołajewska, who was willing to tell us stories about its centennial history. The property includes one other building, which is meant to become a chamber commemorating Władysław Stanisław Reymont, the Polish novelist and 1924 laureate of the Nobel Prize in literature. The owner adds the reservation, "only if we manage to gather the funds”, because these houses require immediate renovation works, and it is becoming growingly difficult to keep them in a good condition. This summer villa once belonged to Reymont’s grandparents, and the writer lived and worked here in the years 1908-1918, a fact of which we are reminded by a commemorative plaque right next to the charming veranda. Preserved records indicate that this was where the fourth part of the Nobel-winning epos "Lato" ("Summer”). 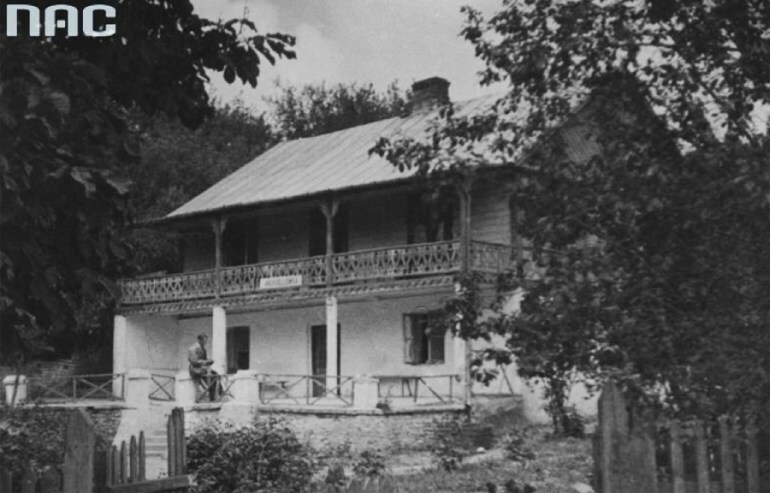 Reymont’s house is located in the oldest part of Otwock, called Aleksandrówka. The history of the street is tragically bound with the fate of Adela Tuwim, Julian Tuwim's mother, who was a patient of the psychiatric hospital Zofiówka during the years of the war, and who hid outside of the territory of the Otwock ghetto. Germans found her in the house on 1 Reymonta street. Her body was thrown out the balcony. She was one of the 10 thousand people murdered by Germans during the liquidation of the Otwock ghetto. "I was constantly drawn to those areas. I think that this was caused by early childhood experiences which were strongly imprinted in me. These experiences were exactly the legend of Otwock times for me!" – Irena Sendlerowa, Righteous Among Nations remembers. 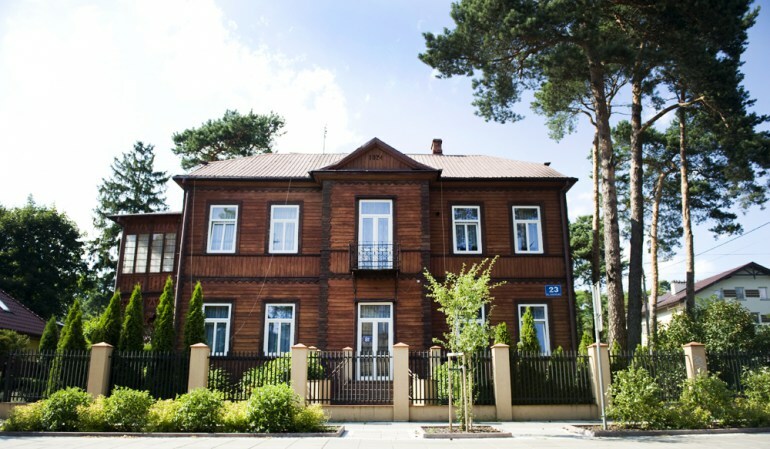 Sendlerowa lived in the house on 21 Kościuszki street in the years 1911-1920. Today, very few citizens of Otwock know or remember this fact. Her father, Stanisław Krzyżanowski – a Polish doctor and social activist – used to run a sanatorium for patients with lung diseases. He implemented progressive treatment, using the unique assets of the spa's climate. He put the sick up on the veranda even in the winter time. 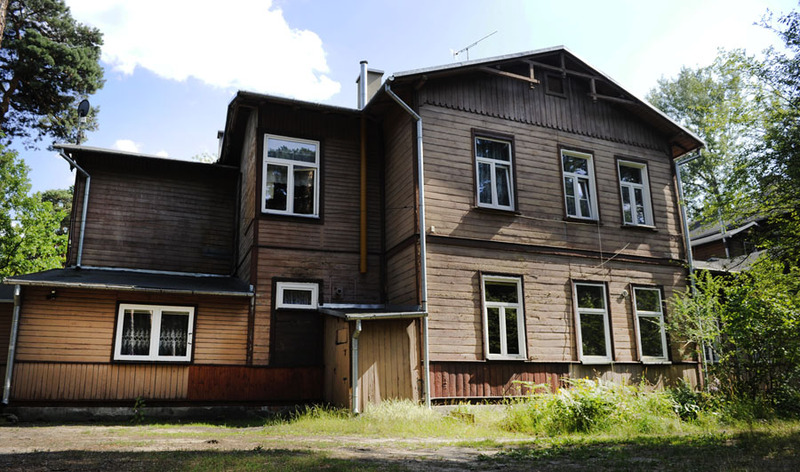 After the doctor’s death, the sanatorium was liquidated. Irena Sendlerowa later remembered her childhood in Otwock as the happiest time of her life. What remains of it is a grand building, surrounded by a park. It once boasted twenty comfortable arranged rooms, glass-covered resting areas, a play room, a library, a bath house, a dining room, and an admissions office. Large wooded areas on 7 Prusa street conceal a small wooden house from the early 20th century. 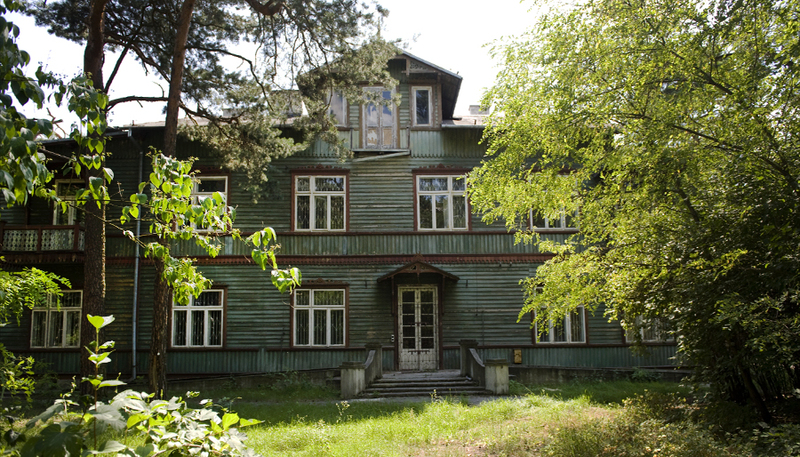 According to the turystycznyotwock.pl portal, this building is the former pension of Mr. and Mrs. Gołembowski, which was presented to nuns with the purpose of running an orphanage there. At the end of the street, one ought to stop by number 13 in order to see the renovated Kasperowiczówka, a Świdermajer-style building with a little tower. The renowned social activist Edward Kasperowicz lived here before the war. He was the secretary of the Society of the Friends of Otwock and the author of the first design for the city’s crest. The excursion towards Świder ends in the oldest and most representative street of Otwock. The largest amount of the historic buildings typical for this area have been preserved on Kościelna street. There are those which have been meticulously renovated, and those which are slowly crumbling down. We stop by the pension house with the number 23, which was once ran by the famous medical doctor, Paweł Martyszewski. The building is crowned with a tympanum and it was created in 1924. The legendary confectionery called "Luxury" ("Luksus” in the original) used to have its premises here before the war, together with the Hotel Polski. The richly decorated veranda hidden away in the back of the street attracts attention to the one-story villa of Odo Bujwida, a renowned bacteriologist and the founder of the Polish school of microbiology. Raised in the 1880s, the villa is one of the oldest Świdermajers. 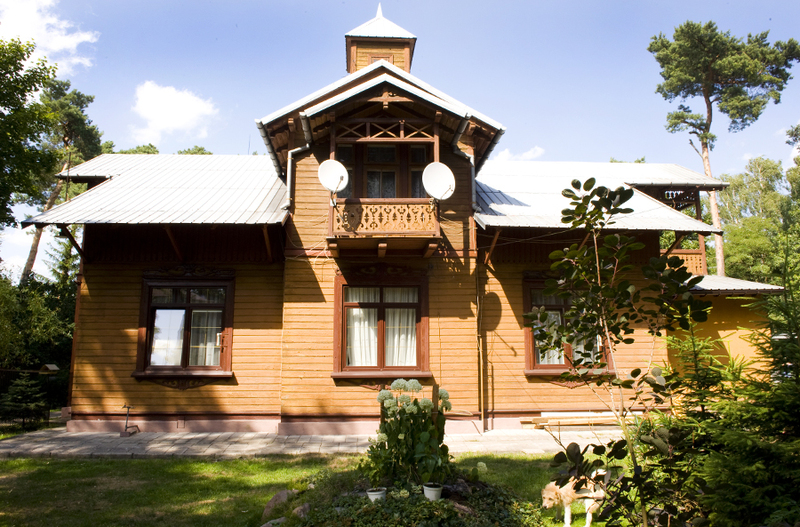 One also cannot miss the 1890 summer villa of General Michał Jacymirski, whose address is 22 Kościelna street. Text written by Anna Legierska, photographic editing by Sylwia Jabłońska and Dagmara Staga.